Orto di Casa Cecconi: Satisfactory crops but tired me!! Being that a good number of the people I know are collapsing with tiredness, including myself, I am not doing a lot at the allotment lately. However, I am picking strawberry every other day, and on Friday night we got the first raspberry as well. Broadbeans are cropping, albeit not too heavily and so is spinach and beet. In a while we will have carrots and beans as well. As it is quite sunny in England these days, I have to keep watering, which takes most of my time on the plot, especially as we get a severe water pressure problem when more than three people are watering together, which, incidentally, is the case every time I have to do it. I dug out the old parsley in my search for space: today there's a complimentary bag for all my colleagues that want some! Next step will be picking the potatoes in the greenhouse to make space for tomatoes: if I'm lucky I will manage to do it at the weekend. 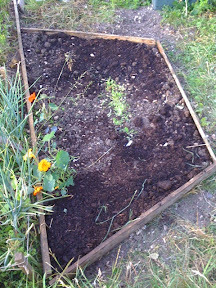 In the meantime, tonight I will have to go and water the seedlings - urgh.